The KhaldeaCalendar 2018 is an exquisite fusion of art, symbolism and digital technology. Each month of KhaldeaCalendar features a astrological ephemeris of the highest precision and a calendar grid incorporating precisely timed astrological aspects and other astro-data, together with a striking abstract image and an inspiring motif for the month's zodiacal sign. The unique sequence of daily lunar phases which unfolds across the calendar face makes it easy to follow the Lunation Cycle from day-to-day and to place Lunation Planning into fruitful practice. Year 2016 introduced a new version of the KhaldeaCalendar. See the sections below for a summary what's new and for useful resources. Importantly, retrograde planets in aspect are new shown in red, and an extended data section has been added. Additionally, waxing aspects are now shown with blue glyphs, replacing the dark red used before 2016. The KhaldeaCalendar is available free online in 14 time zone editions worldwide. The Motif expanding panel features an abstract image and an inspirational message for each month's Sign. New. 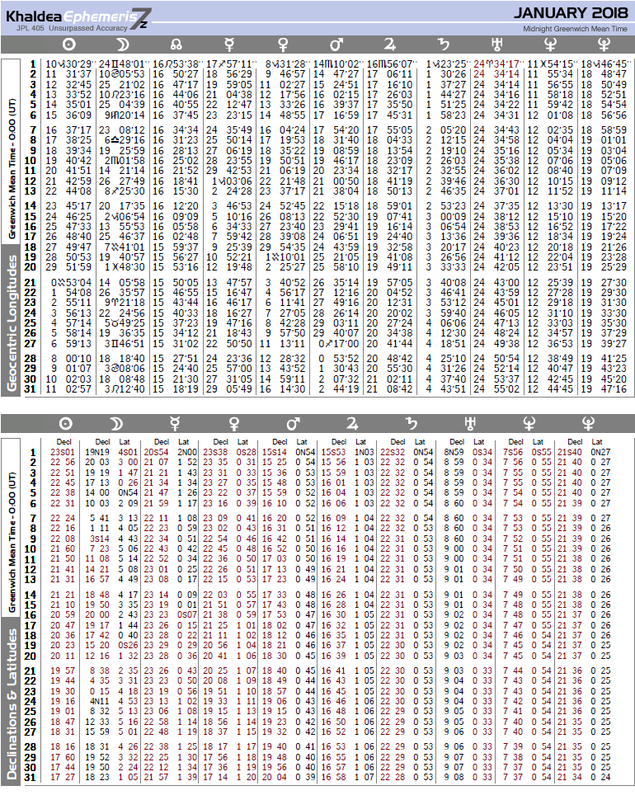 Version 2 of the KhaldeaCalendar includes daily geocentric longitudes, latitudes and declination of the astrological planets — one of 15 monthly pages of the 2010-2020 edition of the the KhaldeaEphemeris7z. 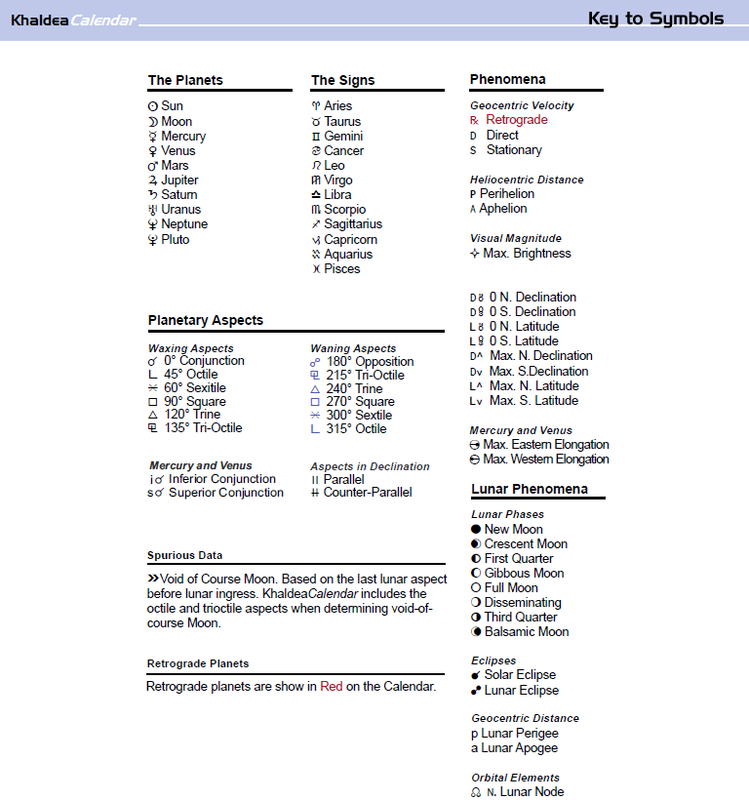 The Key to Symbols lists the glyphs, symbols and colors used in the calendar and ephemeris. NEW: Retrograde planets in aspect now shown in red on the calendar. Waning aspects have been changed from dark red to blue. The symbols used in the extended astro-data section will be improved for the next annual edition. Help make the tools of astrology freely available worldwide. If you find the KhaldeaCalendar useful, please make a freewill donation. The safe and secure PayPal system accepts credit/debit cards and eChecks. The suggested donation is $3-$12. 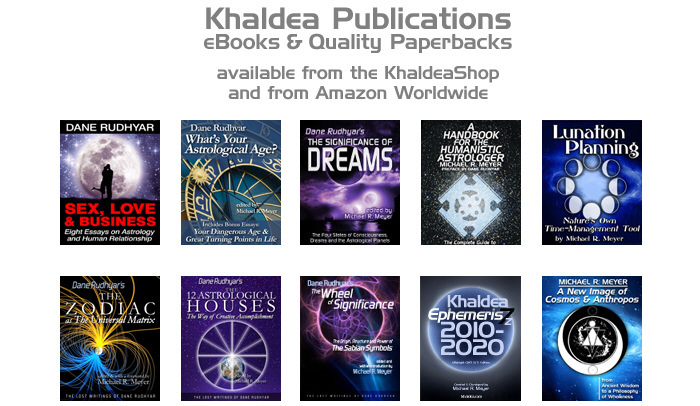 Discover Khaldea Publications. Learn more about how to put the KhaldeaCalendar to productive use with Lunation Planning — a guide to effectively plan, organize and time your important activities and projects. See more about the KhaldeaEphemeris7z. The "About" icon toggles this page. All toolbar icons toggle their panels open and close. NOTE: In this version, the Calendar panel is always open and cannot be contracted. TIP! Use the F11 key on your keyboard to toggle Full Screen viewing. When in Full Screen mode, most of the "chrome" at the top and bottom of the browser is removed, allowing more vertical viewing space. Strike the F11 key again to restore normal viewing with chrome buttons and url address bar. Timed data includes Daylight Saving Time adjustments for all time zone editions, with the exceptions of the Hawaii, Nepal, India, Japan and GMT editions. Time change times and dates are noted on the pertinent months of the calendar. Note: WET, CET, EET time changes occur simultaneously at 1:00 UTC. For Time Zone and Time Change information, visit TimeandDate.com. The KhaldeaCalendar makes it easy to benefit from Lunation Planning — a natural, organic time-management system based on the 29.5-day Lunation Cycle, the ever-changing cyclic relationship between the Sun and the Moon. Everyone, in their own way, naturally feels and performs better when they are attuned with its rhythm. When guided by this natural cycle, our projects and endeavors — be they long-term or short-term, acted out by an individual or by a group — are more successful and rewarding. Lunation Planning is the world's oldest time-management tool. Lunation Planning is universal, it is deeply rooted in all cultures and religions. It is the foundation of virtually all ancient calendars, including the Hebrew, Islamic and the Chinese calendars. Lunation Planning isn't going to save the world. We have to change our attitudes ourselves, but Lunation Planning can help us attune ourselves to a more relaxed, natural and harmonious pulse of living, which in turn may lead to a gradual change of attitude toward ourselves and toward the world. Year 2016 brings version 2 of the KhaldeaCalendar. Some of the new features and enhancements found in version 2 are outlined above, and they are summarized below. 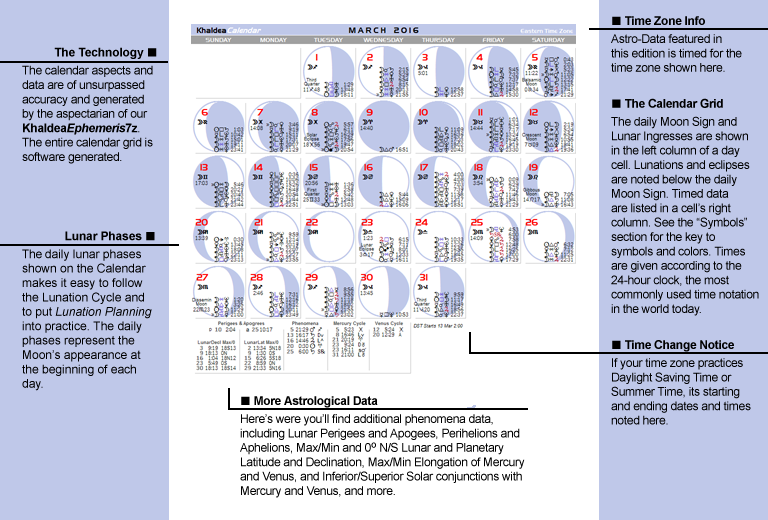 The calendar grid features improved graphics and an extended astrological data section. See the "Symbols" section for a key to the astrological symbols and colors used. Previous users will notice some important changes to the colors used on the calendar grid. Waning aspects are now indicated by blue glyphs, replacing dark red. Retrograde planets in aspect are now shown in red. Solar ingress are no longer highlighted. Version 2 is faster and easier to use. Months of the year are now navigated via interactive tabs, and the entire year is wrapped in a single web page. It's also easier for online users to change time zone — just use the dropdown list beneath the calendar grid to jump to any of 14 time zones worldwide. And this year Hawaii and Nepal have been added to the list. The digital Khaldea Astrological Calendar has been repackaged for version 2 — it now includes art, verse and an ephemeris upgrade. Use the new control panel described above to easily access it all. Just click on a icon to expand or contract an "accordion panel." It's easier to use than to read about. As a special bonus, version 2 features daily geocentric longitudes, latitudes and declinations from the KhaldeaEphemeris7z. KhaldeaCalendar version 2 is produced by KhadeaTechnology's scalable vector graphics engine that creates astrological images in several vector and raster formats, including .pdf, .svg, .wmp,. tiff, .png, .jpg, and .gif. 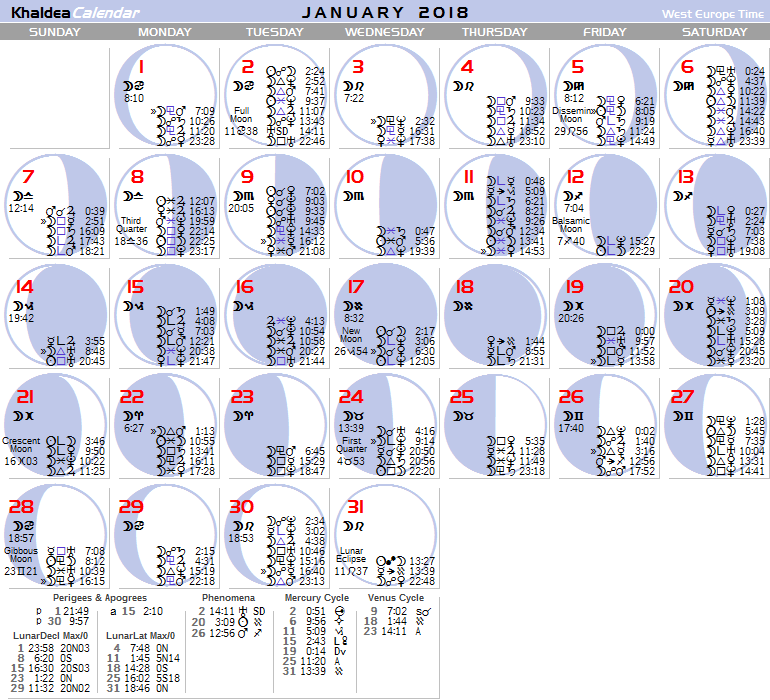 The digital Khaldea Astrological Calendar uses .png raster images. The KhaldeaCalendar module of KhaldeaTechnology is "theme-based" and Unicode compliant — making it's output highly customizable. It can use any aspect set (within constrains of space), or show no aspects; show phases, or no phases; any holiday or event can be displayed. Language modules and unicode enables any language, any script. For print work, press-ready pdf files for entire calendars can produced, as seen in this example. Visit this page for news, updates and tips regarding the Khaldea Astrological Calendar. Discover more about the KhaldeaCalendar, it's history and development. If you find the KhaldeaCalendar useful, please make a freewill donation. Your donation will help the continuing work of CyberWorld Khaldea. Even a few dollars will help, and we make it safe and easy for you to contribute what you can online. CyberWorld Khaldea and The Rudhyar Archival Project are not-for-profit activities supported by your donations and funding by its founder. You may make a donation using a Credit Card via our safe and secure PayPal payment system by clicking the button above. The suggested donation for the KhaldeaCalendar is $3.00 - $12.00 USD. Thanks for helping make the KhaldeaCalendar possible. for Longitudes, Latitudes, Declinations and Daily Motions.